TROIKA REPORT: Rabbis appeal to Pope to bridge gap between Russia and West; tensions over centenary of Armenian Genocide; can Moscow and Tehran form their own 'NATO'? Surprisingly, few media outlets focused on a piece of recent news which TROIKA REPORT deems to be both symbolic and practical. A delegation of prominent leaders from Europe’s Jewish diasporas, approximately half of which are Russian rabbis, have met with the Pope of Rome in the wake of recent attacks on Jewish communities and the victimization of Christians in the Middle East. The leaders of the Jewish communities have also appealed to the head of the Roman Catholic Church to stand forward as an intermediary and peace-broker to mend the ruptured relations between Russia and the West. The meeting took place some 50 years after the Second Vatican Council ruling, as stipulated in the Nostra Aetate declaration, that (1) Jews are not to be held responsible for the death of Christ and (2) anti-Semitism is unacceptable. “I think it is a very significant event. Actually, not unique because there were other meetings between prominent Jewish leaders and the Pope and other dignitaries in Vatican. How important are such meetings for reducing tension in a world plagued by crisis and conflict? On the Catholic side, Father Yanes Sever, a priest from the Moscow-based Society of Jesus, provided his reading of the event for TROIKA REPORT. “The Holy Fathers, Pope Francis and even the ones before him, and the Catholic church in general, but especially under Pope Francis, is always looking for dialogue. People of goodwill can be found in other religions, and also outside religion, who are looking for the good in humanity. Pope Francis is interested in dialogue with these people, in seeking solutions to the problems that face humanity. The Pope is trying to be a bridge to span the divides separating different people. That is between the North and the South, the East and the West. This is very much part of his mission as a pastor. And how important is this message of engaging Russia in a world plagued by crises, confrontation, and Cold War rhetoric? In summary, the invitation to intervene in the current controversy between Russia and Europe has not produced any tangible result – at least, for the moment. Nevertheless, while tailor-made miracles cannot be expected to happen on demand, interfaith dialogue can in any case serve as a tool of soft power. Tensions were soaring and the rhetoric was harsh, even abusive, well before the April 24 commemoration of the 100th anniversary of the massacre of ethnic Armenians by the military of the Ottoman Empire in 1915. The uproar has engulfed Russia as well, since President Vladimir Putin received an invitation to attend the mourning ceremonies in the Armenian capital Yerevan. In an apparent attempt to overshadow this gruesome date in its history, Turkish government made a pre-emptive move in January by scheduling a major function to mark the 100th anniversary of the Battle of Çanakkale (also known as the Battle of Gallipoli) to coincide with the remembrance day of the Armenian Holocaust. This triggered a diplomatic race between Yerevan and Ankara to draw the attention of the global community to their respective parallel events. The official Turkish interpretation of the tragic events has been based on the premise that war calamities were equally appalling for everyone, and that not only Christians but also Muslims fell victim to the hostilities. Armenia, along with the numerous Armenian diasporas scattered around the world, from California and Lebanon to France and Russia, disagree and claim it was a case of genocide. The massacre left 1.5 million of their forefathers dead. This is not disputed, yet Turkey is reluctant to apologise and admit the guilt of the former regime. The battle of commemorative events posed a certain dilemma for the Russian leadership. Some Moscow-based experts suggested that Vladimir Putin should have abstained from visiting Yerevan, given the exceptionally beneficial nature of the Turkish Stream project to channel Gazprom’s natural gas to Europe through Turkey. Was this astute counselling and what was at stake in marking the Armenian Genocide? “First of all, it is necessary to keep in mind that the Battle of Çanakkale, if viewed from the British and the French side, was almost a holiday for the Turks. The date it was celebrated was always the 18th of March. The Turkish president moved the date of the celebrations, acting in this way against Armenia and against historic truth. The Russian president should go to Armenia. Our soldiers saved the Armenians who fled the Ottoman Empire during the genocide. We knew quite well what was happening in that period there. We had a lot of refugees. That was the opinion ofViktor Nadein-Rayevsky. Admittance of guilt by Turkey would amount to a moral victory and lead to lawsuits for compensation to the relatives of the victims. Besides, for many Turks the denial of genocide is built into their national identity. Despite these hurdles, TROIKA REPORT strongly believes that any conciliatory move on the part of the Turkish political establishment could bury the hatchet of century-old animosity and distrust harboured by the Armenians. It could also reanimate Ankara’s much-vaunted “Zero Problems with Neighbors” foreign policy. As for Vladimir Putin’s visit to Yerevan, it was a sensible decision. Armenia has recently joined the Eurasian Economic Union and is the Russia’s forward line in the Caucasus region, while the Armenian community has long been part and parcel of Russia’s multi-ethnic society. Moreover, a gradual improvement in the interaction between Russia and Turkey is visible irrespective of the special relationship between Moscow and Yerevan. Moscow and Ankara still do not see eye to eye on a number of issues, but this does not prevent meaningful cooperation. On top of this, State Duma Speaker Sergei Naryshkin will attend the Battle of Gallipoli centenary. Moscow is thereby sending a clear signal: It has no intention of making friends at the expense of others. Could Moscow and Tehran form a “NATO” of their own? After the breathtaking move by Russia to unfreeze the deal on the supply of the S-300 surface-to-air missiles to Tehran, Iran’s defense minister Hossein Dehghan upped the stakes by suggesting the creation of a “defensive alliance.” According to his vision, this would not be a bilateral venture but a four-pillar institution with China and India also welcomed. The fact that there was no immediate reaction in Moscow is no wonder, since the reverberations of the lifting of the ban on sales of the S-300 have been felt not only regionally but also on a global plane. The United States, Israel and the Sunni Gulf monarchies have been united in their condemnation of the restored comradeship-in-arms between Tehran and Moscow. Barack Obama also raised the stakes in the global gamble over the S-300 missile systems, hinting it would provide no shield to Iran should the U.S. choose to launch air strikes. TROIKA REPORT approached Ivan Safranchuk, editor-in-chief of the journal TheGreat Game: Politics, Business, Security in Central Asia, and asked him for his comments on the issue. “This is not an easy question. There are political and security aspects to the issue. The political aspect is that Iran is becoming an attractive nation that everyone wants to cooperate with. We see this in the case of Germany, France and even the United States with their political and, in particular, business figures rushing to Tehran to negotiate deals. It may not look like a gold rush but the trend is well established. Russia, under the circumstances, cannot remain on the outside. Russia has been a partner to Iran even in difficult times. It would be utterly unwise to remain on the margins of the process. However, not every analyst supports this upbeat appraisal. Alexander Golts, a Moscow-based independent military expert and deputy editor-in-chief of the socio-political publication Yezhednevny Zhurnal, subscribes to a different set of views. “When Mr. Putin lifted the ban on this sophisticated weapon he began a rather risky game. Firstly, he lifted the ban before Iran had begun to fulfill its obligations under the agreement with the six world powers. If we take the worst-case scenario, it means that Iran will receive Russian air-defense systems before it stops running its centrifuges. We cannot exclude a situation in which Iran will behave like North Korea, which simply rejected the non-proliferation treaty (NPT) and kicked out international inspectors. In this case, Iran will have defense weapons to protect its nuclear military facilities. 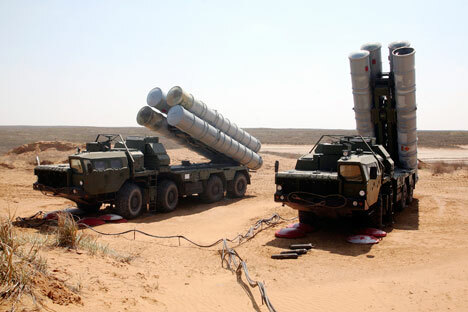 Secondly, we cannot exclude the situation that the possession of S-300s may be the factor that provokes Iran to attack other countries, and that is first and foremost Israel. There is no doubt that Russia promised these weapons to Iran to show the West its so-called “independence,” thereby ignoring the position of the West on this most painful and sensitive issue. Is there a chance of a military alliance between Russia and Iran? So, what could be the hidden agenda behind Moscow’s controversial decision? TROIKA REPORT leans towards the following line of thinking. Firstly, Russia needs to meet contractual obligations which were put on hold due to the imposition of Western sanctions. Unlike France, whose reputation for reliability has been somewhat tarnished by its failure to follow through on the delivery of Mistral helicopter carriers to Moscow, Russia would hate to live with the image of an unreliable trade partner. Secondly, Russia is clearly substantiating its “pivot to Asia.” Moscow can ignore neither Iran’s growing assertiveness nor its desire to join the Shanghai Cooperation Organization (SCO). Unlike India and Pakistan, other aspiring members on the same waiting list to join the SCO, Iran has no unresolved problems with its twin pillars, China and Russia, and can therefore interact smoothly with both of them. Thirdly, Moscow is in a hurry to prove its credentials as a bona fide trade and economic partner prior to the final lifting of the Western sanctions against Tehran. Iran, a nation of 80 million, is no small player: It has one of the 20 largest economies in the world (inferior to that of Turkey but surpassing Australia) with an indisputable growth potential, and the political ambition to be one of the Middle East’s regional powers. As a pre-emptive move, Russia is making offers that Iran cannot refuse, and hopes will form a foundation for a special relationship. But nothing is written in stone.